SpongeBob SquarePants is the principal character in the animated television series SpongeBob SquarePants, which first aired in July 1999 on Nickelodeon. The character was designed by marine biologist and animator Stephen Hillenburg, and is voiced by Tom Kenny. 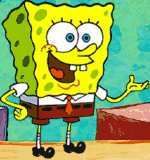 SpongeBob is a yellow, porous, sponge with a face. He has disproportionally thin and short arms and, and resembles a kitchen sponge more than a sea sponge. SpongeBob is very special since he can transform into other shapes when he wants to. SpongeBob can absorb physical blows as well as large amounts of water; he can even put his own pieces back together again if they fall off him. SpongeBob can change the length of his arms and his shape as he pleases. He can retract his arm or regrow them at will. SpongeBob has six long black eyelashes and his eyes are a sky blue color and large dilated pupils. Every little part of SpongeBob is made out of sponge, his eyes, arms, hands, feet, mouth and even his brain. SpongeBob SquarePants mainly wears his white business shirt, a lovely red tie and brown pants. His shoes are shining black. SpongeBob is also known to sometimes run naked or in his underwear. He usually wears a pair of white briefs underneath his pants, although he has been seen wearing blue, green, and red briefs (all at the same time, nonetheless) and even pink to honor his best friend, Patrick. SpongeBob has a green bathrobe for the evenings and he mostly sleeps in his underwear. SpongeBob is always under water, but when he goes "swimming" he wears a pair of blue swimming trunks with his underwear underneath it. On special occasions SpongeBob will wear a lovely red bowtie, like at his house parties or at the Krusty Krab when he is telling Squirrel Jokes. SpongeBob SquarePants is very trusting, generous, friendly and very sweet. He has a buck-toothed grin, tremendously expressive face and square body that complement his pure and good nature. SpongeBob SquarePants will rarely knowingly do wrong or harm to anyone and never without remorse. However, he has been known to shout and curse (even "obscenities") when angry or frustrated. He dislikes scary things and stinky things. Although he is an adult, he has a very childish nature. Although a good-natured and loving sponge, many characters seem to avoid him. SpongeBob SquarePants is very easily overexcited about almost everything, like many different or simple/regular tasks, or even things he doesn't know what they mean (like when Squidward invited him to a strike, SpongeBob celebrated for it although he never heard the word before). This, along with his repetitive talking and loud dolphin-like laughter makes him a huge annoyance to others, especially Mrs. Puff and Squidward Tentacles. Although malleable, SpongeBob's body is generally incredibly weak. He has been known to have enormous difficulty lifting even the lightest of objects. Normally though he can function at a reasonable level. SpongeBob's insides and skeleton have been shown various times (eg. when he appears 'dead' in some future 'flashbacks'), but every time they appear different. His skeleton varies from a simple spine to a perfect square. SpongeBob SquarePants has one pet, a snail named Gary (the analogous of a cat on land, it is also thought that a worm is the analogous of a dog on land). Gary's meows are generally understood by most all residents of Bikini Bottom. Gary and SpongeBob live together in a pineapple under the sea. SpongeBob has a career as a fry cook at the Krusty Krab restaurant, home of the Krabby Patty. He takes his job very seriously and is very good at it. He was employee of the month over twenty six times, which would mean he has worked there at least two years. Then, in The Spongebob Squarepants Movie, he has had 374 consecutive employee-of-the-month awards, which would mean he has worked there for at least 31 years and 2 months. Because of labor laws, this puts his minimum age around 52 years, 2 months. He works alongside Squidward (much to Squidward's dismay), who manages the cash register for his money obsessed boss, Mr. Eugene Krabs. SpongeBob, in some episodes, seems to have attained a celebrity like status in Bikini Bottom for his masterful fry cooking. In an episode where SpongeBob and Squidward go on strike, he is referred to as a "legend" by a young fry cook who wants to take his job and is asked to sign the young boy’s spatula. In another episode, he is offered a job as Neptune's fry cook, but turns it down because Patrick couldn't come too. And SpongeBob has never been a minute late ever for his job (except in "Hooky" he was two minutes late because he got hooked, and in "Have You Seen This Snail" he was fifteen minutes late because he was so tired from searching for Gary.). He spends his free time with his friend Patrick Star (a rather dimwitted Starfish), and especially enjoys practicing karate with his other friend Sandy Cheeks (a squirrel from Texas who wears a space suit to breathe underwater), as well as catching jellyfish at Jellyfish Fields. To date, he has caught (and let go) every jellyfish in Bikini Bottom. SpongeBob SquarePants has yet to keep a boating license (analogous to a driver's license) because he fails every driver's test at Mrs. Puff's Boating School, mainly due to a tendency to become nervous once behind the wheel (he has been shown to know what he's doing everywhere but inside the boat). Despite this, he perpetually and continuously attends boating school in an attempt to get his license (and because he enjoys it), much to the woe and frustration of his boating instructor Mrs. Puff. At one point, Mrs. Puff becomes so frustrated she gives SpongeBob his boating license by allowing him to do "extra credit". She then takes it back realizing how much chaos he could cause with his license. In several episodes, most SpongeBob SquarePants video games, and The SpongeBob SquarePants Movie, it is suggested he has brilliant guitar and singing skills. Many times he sings some songs in a different voice, probably by a different voice actor. He also likes to blow bubbles, surf, sun bathe, play the ukulele, watch his favorite TV show, The New Adventures of Mermaidman and Barnacleboy and do his job at the Krusty Krab.